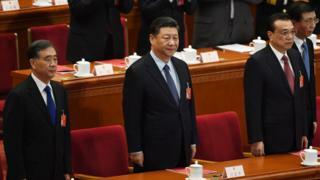 Delegates voted overwhelmingly in favour of the law on the final day of the National People's Congress (NPC). Delegates at the NPC - the annual meeting of China's legislature - passed the bill with 2,929 in favour, eight against and eight abstentions. The trade battle has seen both sides impose tariffs on billions of dollars worth of one another's goods since last year. The BBC's Stephen McDonell said the Chinese government appears to have rushed through the investment law as an olive branch to the US amid trade war negotiations. In a statement earlier this week, the American Chamber of Commerce in China welcomed the "legislative effort to improve the foreign investment climate". But it said some provisions were "still quite general and do not address a number of the persistent concerns of foreign companies or foreign-invested enterprises in China".